Shell = (dc, ch1) 3 times, and dc- all in same space. Long SC= working over sc of previous row below-- insert hook into same stitch as sc worked in row below, yo and pull yarn up to current row level, yo and through both loops on hook. With MC chain 243, work shell in 4th chain from hook. *Skip next 2 chains, sc in next ch, skip next 2 chains work shell in next chain - Work from * across , after last shell chain 1 and continue working in pattern on opposite side of foundation chain--- having shell in same chain as shell on previous side and sc in same chain as sc on previous side. join in 3rd chain of beginning ch 4. Fasten off. 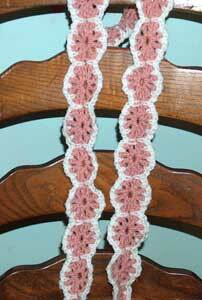 Edging: Join white in any chain 1 space at end of scarf, chain 1, sc in same space as joining. * chain 2, sc in next chain 1 sp, work from * to last ch 1 space of shell, ch 2, work a long sc over sc of scarf and into foundation chain. Chain 2 repeat from * around. Join, fasten off. Weave in loose ends. Copyright 2006 Stormy'z Crochet. Do not claim pattern as your own or sell pattern to others. You may sell items you make with this pattern at craft fairs or to friends and family but please do not sell items made with this pattern on the internet without prior permission.